Speaking to about 2,500 supporters in downtown Miami’s packed and steamy James L. Knight Center, Donald Trump revealed a little bit about his campaign strategy. “You ever see her 18-minute speech? Bomb. Bomb. Bomb. See ya. See ya. I’m going home,” Trump said. 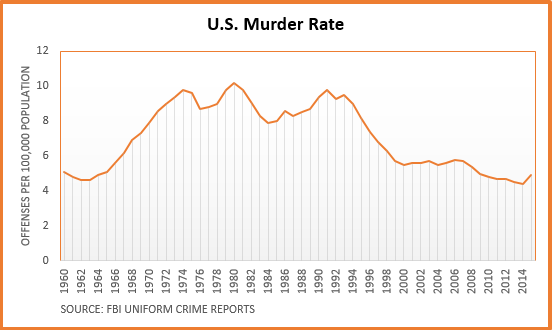 Though Trump talked about violence “happening all over our country,” homicides and violent crimes overall have declined over the past several decades. Trump falsely claimed Clinton plans to bring in “620,000 refugees in her first term.” Clinton has not said how many refugees she would accept in fiscal 2017 or beyond. Trump said Bill Clinton signed NAFTA, which “destroyed our manufacturing in this country.” Economic studies say NAFTA’s overall net impact on jobs has been small, and NAFTA was actually signed by President George H.W. Bush, though Clinton signed a bill enabling NAFTA. Trump promised to provide “big league tax reduction” for middle-class families. The Tax Foundation says everyone would get tax cuts under Trump’s plan, though the biggest cuts — both in raw dollars and as a percentage of income — would go to the wealthiest. Meanwhile, Trump said Clinton would “raise your taxes substantially.” She would not, unless you are among the top 10 percent of taxpayers. Trump said “58 percent of African American youth are not employed.” But that includes millions of 16- to 24-year-olds who are not looking for work, including many in school. The unemployment rate among this group was 15.7 percent in August. Trump blamed Obama for the fact that “14 million people have left the workforce entirely.” But it’s part of a decades-old trend, largely driven by aging baby boomers and other changing demographics. Trump said under Obama “another 2 million Hispanic Americans have fallen into poverty.” That’s an outdated figure that has since been trimmed to 1.1 million. Moreover, the percentage of Hispanic Americans living in poverty has dropped under Obama. Trump also cherry-picked high rate increases on the ACA exchanges in claiming that “your premiums” are “through the roof.” Most people get their insurance through employers, where premiums have been growing at historically low rates. Premiums on the exchanges vary, with one analysis finding an average proposed increase of 9 percent across 17 major cities. This is just a sample of what we found. We will delve more deeply into these and a number of misleading or false claims from those speeches in our Analysis section. And as part of one of our new features, we’ve posted an annotated version of Trump’s Miami speech. Click on highlighted text to read our corresponding fact-checks. Note to readers: This is the first part of a two-part series examining the factual claims made by both major candidates. We will post our findings about Hillary Clinton’s stump-speech claims in a subsequent article. Donald Trump, a businessman who has never held or run for public office, takes pride in campaigning “the old-fashioned way,” as he put it in Miami. He boasts that he is spending less on advertising than Hillary Clinton – and he is right. Trump boasts that he speaks at rallies more frequently and far longer than Clinton does at her rallies — and he is right again. We looked at three recent Clinton speeches and found she spoke for an average of 28 minutes. Trump, on the other hand, regularly speaks for 45 minutes or longer. Trump’s rallies – interrupted by applause and punctuated by chants of “U.S.A.” — get tremendous national media coverage. Trump leads Clinton in “earned media” — press interviews and appearances on various media including TV, radio, online and print publications, according to mediaQuant, a media measurement company. But those reports on his campaign rallies don’t often include more than a sound bite or two. The day-to-day appeals in stump speeches often go largely uncovered, though. The words are nearly identical in stop after stop for weeks and weeks. And the media are looking for new things to report. But those speeches — repetitive as they may be — represent the core appeal to voters. And so, as we began doing in the 2012 campaign, we will take a deeper dive looking into the accuracy of both Clinton’s and Trump’s stump speeches. In this story, we will look at claims from Trump’s speeches in Miami on Sept. 16, Colorado Springs on Sept. 17 and Fort Myers, Florida, on Sept. 19. There’s a lot of misinformation, so we decided to break it down by subject. Trump, Sept. 19: Altogether, [Clinton’s] plan would bring in 620,000 refugees in her first term with no effective way to screen them or vet them. Law enforcement said there’s no way. This claim, which Trump made in Fort Myers, is a combination of two misleading talking points. First is the claim that Clinton “would bring in 620,000 refugees in her first term.” She has not said how many she would accept in fiscal 2017 or beyond. As we have written, Trump is relying on an unsupported assumption made in a Senate Republican staff report. Clinton last year said that she would have accepted up to 65,000 Syrian refugees in fiscal year 2016, which will end Sept. 30, instead of the 10,000 set by Obama. The partisan report assumes that Clinton would accept an additional 55,000 Syrian refugees in each of her four years in office, increasing the total number of refugees the U.S. annually accepts from 100,000 this year to 155,000. That’s faulty logic. The Clinton campaign told us that she remains committed to accepting more than 10,000 Syrian refugees — provided that they can be properly screened. But she has not said how many more she would accept in the future or how many refugees in total she would admit. Trump also said there is “no effective way to screen [Syrian refugees] or vet them.” The process for admitting a refugee has multiple steps, including background checks. First, the United Nations High Commissioner for Refugees, or sometimes a U.S. embassy, refers a refugee for resettlement in the U.S. After that, there’s an initial multistep security clearance by the National Counterterrorism Center, the FBI’s Terrorist Screening Center, the Department of Homeland Security and the Department of Defense that is followed by an in-person interview abroad with U.S. Citizenship and Immigration Services — which has to approve the application. That’s followed by a medical screening and a match with one of the voluntary agencies in the U.S. that sponsor refugees. And then there’s another security clearance to complete the process. Trump, Sept. 16: It’s the same reason why she won’t take responsibility for her central role in unleashing ISIS all over the world. Trump points to the withdrawal of troops from Iraq in 2011, under Obama, as “the founding of ISIS,” but experts told us the expansion of the Islamic State can’t be pinned on the troop withdrawal alone — if at all. And there’s the fact that President George W. Bush had signed the agreement and set the date for that withdrawal. Experts have pointed to a variety of actions that could have contributed to the rise of ISIS, including: the U.S.-led invasion of Iraq in 2003; the decisions by the U.S.-led provisional coalition government in 2003 to disband the Iraqi army and dissolve and ban the Baath Party, which drove Sunnis into militant groups; the rule of Iraqi Prime Minister Nuri al-Maliki, whose Shia government further ostracized Sunnis; the withdrawal of U.S. troops from Iraq by Dec. 31, 2011; the weakening of the Iraqi army, which abandoned posts in 2014 rather than fight ISIS; and the Syrian civil war, which began in 2011. Trump, Sept. 16: People who support the police, who want crime reduced and ended, and who are not prejudiced. They’re concerned and loving citizens whose hearts break every time an innocent child is killed violently on the streets, which is happening all over our country. Trump regularly refers to rising violent crime in America, and often cites rising violence or murder rates in selected cities like Chicago. In his Miami speech, where he said violent crime is “happening all over our country,” Trump also said African Americans “can’t walk down the street” without getting shot. Recently released FBI data show the number of overall violent crimes in the U.S. increased by nearly 4 percent from 2014 to 2015, and murder and nonnegligent manslaughter went up by 10.8 percent. 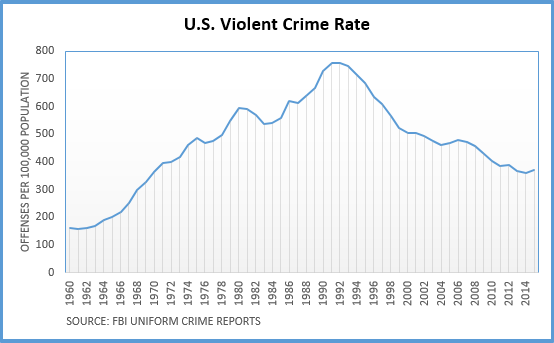 While authorities are concerned about the one-year violent crime increase, as USA Today reported, the 2015 figure is still lower than in 2011, and 16.5 percent below the level a decade ago. As for cities, the New York Times ran a story in May on increases in homicides in some cities, and decreases in others, for the first three months of 2016 compared with the first three months of 2015. New York Times, May 13, 2016: Data released Friday by the Major Cities Chiefs Police Association, based on reports from more than 60 cities, showed notable increases in murders in about two dozen cities in the first three months of the year compared to last year and a 9 percent increase nationwide. But nearly 40 cities showed a decline or remained essentially flat. Criminology and statistics experts told us we can’t discern a trend from such small snapshots in time. Trump, Sept. 16: We’re going to renegotiate NAFTA. Probably the worst trade deal ever agreed to, signed in the history of the world, not in the United States. It’s destroyed our manufacturing in our country. It’s destroyed. And by the way, guess who signed it? Bill Clinton. First, to clarify, the North American Free Trade Agreement was negotiated and signed by President Bill Clinton’s predecessor, President George H.W. Bush. It is true that Clinton signed the bill enabling NAFTA in 1993; however, it took Republican congressional support to get that bill to his desk. The Senate passed the North American Free Trade Agreement Implementation Act, 61-38, in November 1993, with 34 Republican votes, and the House passed it 234-200, with 132 Republican votes. As for Trump’s claim that NAFTA destroyed manufacturing in the U.S., economic studies say NAFTA’s net impact on U.S. jobs has been small. There has been a 27 percent drop in manufacturing jobs from December 1993, the month before NAFTA took effect, to August of this year, according to the Bureau of Labor Statistics. Many factors, beyond the 1994 trade agreement, impact jobs and the economy, and as we have written before, economists have debated the effects of the trade agreement. But overall, economists have found the net effect on jobs from NAFTA has been small. Trump, Sept. 17: We’re going to have a massive tax reduction, big, big league tax reduction, for working and middle-class families. As he did in Colorado Springs, Trump routinely pitches his tax plan as a boon for “working and middle-class families” without mentioning the benefits for the wealthy. Trump’s new tax plan — which offers more modest tax relief than his initial plan — would result in tax cuts for everyone, according to an analysis by the pro-business Tax Foundation. But the cuts get bigger — both in terms of raw dollars and as a percentage of income — the higher one’s earnings, with those with the highest incomes getting the largest tax breaks. The Tax Foundation analyzed the plan’s impact two ways: without taking into account the projected effect on the U.S. economy (static) and with taking into account those effects (dynamic). Whether the tax cuts for middle-class families would be “massive” is a matter of opinion, of course, but according to the Tax Foundation calculations under a static assumption, those in the bottom 80 percent of taxpayers would see an increase in after-tax income of between 0.8 percent and 1.9 percent. For a family making $50,000, a 1 percent increase in after-tax income would mean an extra $500, the Tax Foundation’s Alan Cole told us in an email. “Arguably that’s a lot. Arguably it’s not,” he said. Gains for those in the upper-income categories would be more dramatic. Those in the top 20 percent of taxpayers would see an increase in after-tax income of between 4.4 percent and 6.5 percent (on a static basis), the Tax Foundation concluded. The largest gains — 10.2 percent to 16 percent — would come to the wealthiest 1 percent of taxpayers. The tax cuts would be bigger provided the economy grows as the Tax Foundation projects (dynamic), with the bottom 80 percent of taxpayers seeing an increase in after-tax income between 6.7 percent and 9 percent. But again, higher gains would be realized among those at the top of the income ladder. The Tax Foundation also projected that Trump’s tax plan would reduce federal revenue by between $4.4 trillion and $5.9 trillion on a static basis over 10 years, and by between $2.6 trillion and $3.9 trillion after accounting for the larger economy. Trump, Sept. 16: And by the way, Hillary Clinton is raising your taxes substantially. In fact, Clinton’s plan would not raise “your taxes substantially,” as Trump said in Miami — unless you are among the top 10 percent of taxpayers. Analyses by the nonpartisan Tax Policy Center and the Tax Foundation both concluded that almost all of the tax increases proposed by Clinton would fall on the top 10 percent of taxpayers. Hardest hit would be the less than 0.1 percent of taxpayers who earn more than $5 million per year. The top 1 percent in 2017 — those with incomes above $730,000 (in 2015 dollars) — would see a reduction in after-tax income of about $78,000, or 5 percent, the Tax Policy Center estimated. “Taxpayers outside the top 5 percent (those earning less than $300,000 in 2015 dollars) would see little change in average after-tax income,” according to TPC. Trump, Sept. 17: But her comments display the same sense of arrogance and entitlement that led her to violate federal law as secretary of state, hide and delete 33,000 emails. Trump also routinely accuses Clinton of deleting 33,000 emails as part of a criminal cover-up. But there is no evidence that she intentionally deleted any work-related emails. Clinton’s lawyers identified 30,490 work-related emails and 31,830 personal emails on Clinton’s private server. She turned over the 30,490 work-related emails to the department in December 2014, and told her staff that she no longer needed the rest. Trump is referring to the roughly 32,000 emails that Clinton deemed personal. But the department’s email retention policy allows its employees to determine which emails are work-related and requires those records to be preserved. “Messages that are not records may be deleted when no longer needed,” according to the State Department’s Foreign Affairs Manual (5 FAM 443.5). Trump, Sept. 17: Fifty-eight percent of African-American youth are not employed. Trump, who repeated this talking point in Colorado Springs, leaves the misleading impression that 58 percent of black youths want jobs but cannot find them. That’s not the case. When Trump used a similar figure in early August, his campaign cited annual average data for 2015 from the Bureau of Labor Statistics for African Americans 16- to 24-years-old. But that 58 percent figure included not only the unemployed, but nearly 2.88 million African-American youths who were not in the labor force, which means that they were not working and not looking for work. Many of them are high-school and college students. Using the Trump campaign’s math, 55 percent of black youth were “not working” as of August, according to BLS data. We found the comparable figure for white youth would be around 46 percent. It would be 51 percent for Hispanic youth and 61 percent for Asian youth. The official unemployment rate for African Americans age 16 to 24 was 15.7 percent in August, according to the most recent nonseasonally adjusted data from the Bureau of Labor Statistics. Trump, Sept. 17: Another 14 million people have left the workforce entirely, it all came in, entirely since President Obama came into office. It’s true, as Trump said, that the total number of people “not in the workforce” has increased by nearly 14 million during Obama’s presidency, according to data from the Bureau of Labor Statistics. But to lay that trend entirely at Obama’s feet is misleading. As the chart below from the Bureau of Labor Statistics shows, the number of people “not in the workforce” has been steadily rising for decades. A report by the nonpartisan Congressional Budget Office in 2014 estimated that about half of the decline in the labor force participation rate was due to long-term structural trends, mainly aging baby boomers reaching retirement age. In other words, Trump can argue that Obama’s policies have contributed to at least some of that rise in the number of people who have left the workforce. But some of that is due to demographics, and economists predict the labor force participation rate will continue to decline for the next decade and more. Trump, Sept. 16: Since President Obama came into office another 2 million Hispanic Americans have fallen into poverty. It’s catastrophic. And it’s totally unacceptable. This is an outdated figure that is nearly double the most recent number. Using the latest 2015 data from the U.S. Census Bureau — which was available when Trump made his comment in Miami — the number of Hispanic Americans living below poverty increased by 1.1 million between 2008, the year before Obama took office, and 2015. Trump was referring to the 2014 Census estimate. While the number of Hispanics living in poverty is still higher than it was in 2008, the Hispanic population also increased dramatically — by more than 9 million — over that same period. As a result, the percentage of Hispanics living in poverty actually decreased over that same period, from 23.2 percent to 21.4 percent. Trump also does not acknowledge that the Great Recession led to a spike in poverty, which peaked in 2010 and has now begun to decline. Actually, it already has mostly reversed. The percentage of Americans living in poverty in 2008 was 13.2 percent. It climbed as high as 15.1 percent during the Great Recession. But in 2015, the rate dropped to 13.5 percent, a mere 0.3 percentage points higher than it was in 2008. The poverty rate plunged 1.2 percentage points from 2014 to 2015, the biggest drop since 1999. Trump, Sept. 16: Now you know she’s very much against the Second Amendment. She wants to destroy your Second Amendment. Guns, guns, guns, right. I think what we should do is she goes around with armed bodyguards like you have never seen before. I think that her bodyguards should drop all weapons. They should disarm right? Right? I think they should disarm immediately. What do you think? Yes? Yes. Take their guns away. She doesn’t want guns. Take their — let’s see what happens to her. Take their guns away. OK? It’ll be very dangerous. Trump’s comment on disarming Clinton’s bodyguards received a lot of media attention, as mentioned earlier. But Clinton’s gun violence prevention proposal does not call for banning all guns. As we have written, it would impose restrictions, including a ban on semi-automatic “assault weapons.” Clinton has said her gun proposals are “consistent with constitutional rights,” acknowledging that gun owners have a constitutional right to own firearms. Trump, Sept. 16: Also on my first day I’m going to ask Congress to send me a bill to immediately repeal and replace disastrous Obamacare. It has turned out to be a disaster. This alone will instantly save another 2 million jobs. And if you look at your premiums, it’s through the roof. And by the way, on November 1, just before the election on November 8, new numbers are coming out which will show 40, 50, 60 percent increases. They want to delay it until after the election because it’s election — it’s a disaster. It’s a disaster. Repealing the Affordable Care Act wouldn’t “save another 2 million jobs,” as Trump said. His false claim is now a years-old twisting of the nonpartisan Congressional Budget Office’s analyses of the ACA. The CBO has estimated a decline in the amount of labor that workers choose to supply — not a reduction in the number of jobs. CBO’s December 2015 report, which Trump’s campaign cited when he made this claim in August, described workers deciding to work fewer hours or retire earlier than they otherwise would, mainly in response to the law’s income-based subsidies and other coverage-expanding provisions. A day after the 2014 report was released, then CBO Director Douglas Elmendorf told Congress that claims about “lost jobs” would be wrong. “The reason that we don’t use the term ‘lost jobs’ is there’s a critical difference between people who would like to work and can’t find a job or have a job that is lost for reasons beyond their control and people who choose not to work,” Elmendorf said on Feb. 5, 2014. As he has done before, Trump also cherry-picks proposed rate increases on the ACA exchanges in claiming that “your premiums” are “through the roof.” Premiums for employer-based plans, where most insured Americans get their coverage, have been rising at historical low rates for the past several years. Only 7 percent of the U.S. population bought their own insurance on the individual market, such as through the exchanges, according to the nonpartisan Kaiser Family Foundation. It’s true that some insurers have requested rate increases for 2017 premiums above 50 percent. Any increase above 10 percent has to be submitted and approved by government regulators for the next open enrollment period, which begins Nov. 1. But those high increases could well be outliers. The Kaiser Family Foundation analyzed preliminary rates in cities in 16 states and Washington, D.C., and found the second-lowest cost silver plan would increase by a weighted average of 9 percent from this year if the rates hold, varying widely from a drop of 13 percent in Providence, Rhode Island, to a hike of 25 percent in Nashville. For 2016, the increase was only 2 percent for those areas, and KFF’s experts do believe exchange premiums will rise more this year than they have in the past. Also, 80 percent of those buying exchange plans get federal subsidies, which lower premium contributions to a percentage of their income. Trump, Sept. 19: I was against going into the war in Iraq, but we got out the wrong way. Throughout his campaign, Trump has repeatedly claimed — as he did in Fort Myers — that he opposed the Iraq War before the March 19, 2003, invasion, often taking credit for his judgment and vision, but he has yet to produce any evidence that it’s true. Trump cites as evidence a January 2003 TV interview to claim that he opposed the war from the beginning. In that interview, Trump said polling showed the economy is a “much bigger problem” for President Bush than Iraq, but he did not say whether the U.S. should or should not invade. He also has pointed to an interview with Esquire that ran in the August 2004 edition — 17 months after the Iraq War started. Trump, Sept. 19: The failures in Iraq were compounded by Hillary Clinton’s disaster in Libya. Trump, Sept. 19: Do you all remember President Obama’s apology tour? He apologized for the United States. We’re sorry, we’re so sorry. We’re so sorry. In a speech in Cairo, in June 2009, for example, Obama spoke about tensions between the U.S. and the Muslim world, and placed blame on both sides. And then he called for a “new beginning.” That’s not the same as apologizing. Our fact-checking colleagues at PolitiFact and the Washington Post Fact Checker reached the same conclusion: Obama never apologized. Corsaniti, Nick, Confessore, Nicholas and Barbara, Michael. “Donald Trump Says Hillary Clinton’s Bodyguards Should Disarm to ‘See What Happens to Her.’” Washington Post. 16 Sep 2016. Diamond, Jeremy. “Trump on Clinton’s guards: ‘Take their guns away, see what happens to her.‘” CNN. 17 Sep 2016. Louis, Errol. “Donald Trump’s dangerous rush to judgment.” CNN. 20 Sep 2016. Smith, Candace and Santucci, John. “Trump Calls Former Defense Secretary Gates a ‘Clown,’ Following Scathing Op-Ed.” ABC News. 17 Sep 2016. Kiely, Eugene. “Trump’s Terrorism Speech.” FactCheck.org. 15 Aug 2016. White House website. “Infographic: The Screening Process for Refugee Entry into the United States.” 20 Nov 2015. U.S. Senate Committee on the Judiciary. “Oversight of the Administration’s FY 2016 Refugee Resettlement Program: Fiscal and Security Implications .” 1 Oct 2015. CNN Transcripts. “The Situation Room: Donald Trump Interview.” 16 Mar 2007. Thompson, Mark. “How Disbanding the Iraqi Army Fueled ISIS.” Time. 28 May 2015. Carter, Chelsea J. “Iraqi soldiers, police drop weapons, flee posts in portions of Mosul.” CNN. 13 Jun 2014. FBI website. “Latest Crime Statistics Released: Increase in Violent Crime, Decrease in Property Crime.” 26 Sep 2016. New York Times. “U.S. Homicide Rates Rise in Early 2016.” 12 May 2016. Friedman, Matthew, Grawert, Ames and Cullen, James. “Crime in 2016: A Preliminary Analysis.” Brennan Center for Justice. 19 Sep 2016. Wallace, Caroline. “Groundhog Friday.” FactCheck.org. 1 Jul 2016. C-SPAN. “North American Free Trade Agreement Signing.” 7 Oct 1992. FactCheck.org. “Trump’s Foreign Policy Speech.” 28 Apr 2016. Bureau of Labor Statistics. “Employment, Hours, and Earnings from the Current Employment Statistics survey (National): Manufacturing Jobs.” Accessed 27 Sep 2016. Robertson, Lori. “More NAFTA Nonsense.” FactCheck.org. 3 March 2008. (NAFTA).” Congressional Research Service. 16 Apr 2016. Auxier, Richard. “An Analysis of Hillary Clinton’s Tax Proposals.” Tax Policy Center. 3 Mar 2016. U.S. Department of State. Foreign Affairs Manual: Electronic Records Management. Gass, Nick. “State Dept. ordered to review 15,000 Clinton emails for potential release.” Politico. 22 Aug 2016. FBI website. “Statement by FBI Director James B. Comey on the Investigation of Secretary Hillary Clinton’s Use of a Personal E-Mail System.” 5 Jul 2016. Bureau of Labor Statistics. Labor Force Statistics from the Current Population Survey: Household Data, Annual Averages. Bureau of Labor Statistics. Unemployment rate – 16 to 24 years, Black or African American. Bureau of Labor Statistics. Labor Force Statistics from the Current Population Survey: Not in Labor Force. Congressional Budget Office. “The Slow Recovery of the Labor Market.” 4 Feb 2014. Farley, Robert. “Declining Labor Participation Rates.” FactCheck.org. 11 Mar 2015. Edwards, Ashley. “2015 Drop in Poverty is Largest on Record Since 1999.” U.S. Census Bureau. 13 Sep 2016. The American Presidency Project. “Hillary Clinton Interview with Chris Matthews of MSNBC.” 5 Jan 2016. Harris, Edward. “How CBO Estimates the Effects of the Affordable Care Act on the Labor Market.” Congressional Budget Office. December 2015. Kaiser Family Foundation. “Average Annual Workplace Family Health Premiums Rise Modest 3% to $18,142 in 2016; More Workers Enroll in High-Deductible Plans With Savings Option Over Past Two Years.” 14 Sep 2016. Kaiser Family Foundation. Health Insurance Coverage of the Total Population. Centers for Medicare and Medicaid Services. Fact Sheet: State Effective Rate Review Programs. Claxton, Gary and Levitt, Larry. “What to Look for in 2017 ACA Marketplace Premium Changes.” Kaiser Family Foundation. 5 May 2016. Trump, Donald. “Donald Trump: How I’d Run the Country (Better).” Esquire. 8 Sep 2016. Kaczynski, Andrew. “Trump Says Removing Qaddafi Was Mistake, But Pushed For Libya Intervention In 2011.” BuzzFeed. 19 Jan 2016.